Is your old mattress not cutting it for you anymore? Do you need to buy a new one, but also watch your budget? Thankfully, it’s not as difficult as you might think to find a high-quality mattress at an affordable price. But, if you’re too focused on finding the cheapest option, you might end up with a less-than-ideal product. That’s why we’ve made this guide that covers the best cheap mattresses, considering factors like longevity, comfort, and warranty. It can be hard to find a memory foam mattress that doesn’t cost an arm and a leg, but the Zinus Green Tea Mattress is an exception to this. The memory foam materials used in its construction cradle your body for pressure relief and the firm base gives your spine the support it needs. This mattress comes in a few different firmness levels and heights, but this review will cover the 10-inch version. You sleep with a restless partner: Memory foam is known as the best mattress material for absorbing motion. Even if your partner tosses and turns every night, you should find that you still get restful sleep on this bed. You need pressure relief: The Zinus Green Tea Mattress has a layer specifically intended to relieve pressure in your body. If you often wake up sore, this could be a welcome change. You don’t want a bouncy bed: The materials in the Zinus Green Tea Mattress make for minimal bounce. If you prefer a springy feeling, you might want to choose a coil mattress instead. You’re sensitive to off-gassing: Many bed-in-a-box products come with a slight chemical smell, but the Zinus Green Tea Mattress found a solution to this. The materials are infused with castor seed oil, charcoal, and green tea extract to keep the mattress smelling fresh over time and to discourage bacterial growth. Memory foam is known for sleeping hotter than other materials, but the Zinus Green Tea Mattress has an aerated second layer and egg-crate base structure for airflow. However, if you sleep very hot compared to the average person, you might want to look at the Cooling Gel upgrade offered by Zinus. The cover of the Zinus Green Tea Mattress is made with a knitted Jacquard, a stable and stretchy material. Below this is a 2.5-inch layer of BioFoam® for pressure relief and contouring. Under this is a 2-inch layer of pressure-relieving foam that also regulates the mattress temperature and acts as a transition layer. And lastly, there’s a 5.5-inch layer of dense foam that provides support. The 10-inch Zinus Green Tea Mattress is a 6/10 in terms of firmness, which will accommodate the widest variety of people and sleeping positions. It has a very minimal amount of bounce and a slow-responding surface. Since memory foam absorbs motion so well, you won’t have to worry about disturbing your partner or waking up easily when your pet jumps into bed with you. The Zinus Green Tea Mattress is CertiPUR-US® certified, meaning it contains acceptable levels of heavy metals and other potentially harmful chemicals and it comes with a 100-night sleep trial period and a 10-year warranty. The green tea infusion makes this bed quite unique. If you’re looking for a mattress with minimal bounce, good motion absorption, and a deep cradling hug, this could be the right choice for you. The Lucid Memory Foam Mattress works well for all types of sleepers, including back, stomach, side, and combination sleepers. The soft surface absorbs motion well, so you won’t disturb your partner if you move around. And, the gel-infused foam in this mattress can minimize aches and help align your spine while you sleep. 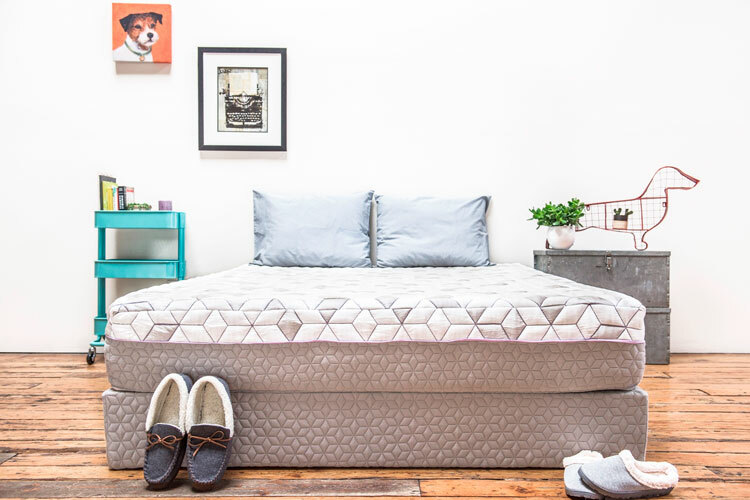 You want a removable cover: If you live in a hot climate or just like to be able to put your mattress cover in the washer, you’ll appreciate the Lucid Mattress. The TENCEL® blend cover can be easily removed for washing, but make sure you check the care instructions on the tag before putting it in the washing machine, as some should be hand-washed instead. You get hot in your sleep: The Lucid Mattress sleeps cool for a memory foam bed. It has superior airflow and a breathable design to keep you at a comfortable temperature while you sleep. You’re prone to allergies: This bed is naturally resistant to dust mites and other irritants, which makes it good for people with allergies. If you’re sensitive to allergens, this could be a good solution. You have back pain: The Lucid Memory Foam Mattress conforms to your unique body shape and helps align your spine. If you suffer from back pain, this could help ease your discomfort and cradle your body back to pain-free. 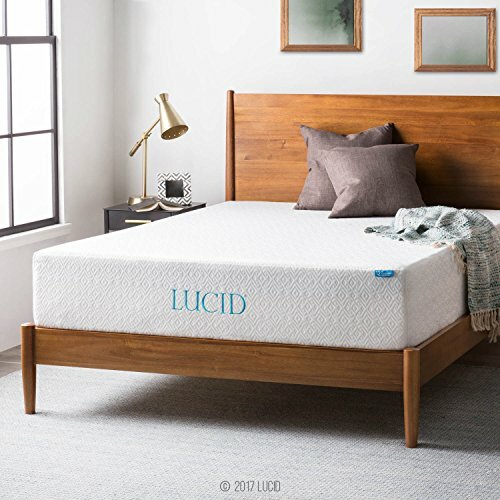 The 10-inch Lucid Gel Memory Foam Mattress has a breathable cover, followed by a soft, gel-infused memory foam layer, for contouring and support. Under this is a supportive base made from 7.5 inches of dense foam. This offers good support for every sleeping posture. The bed is a medium-plush level of firmness. If you’re carrying some extra weight, this should provide you with the support you need, though it’s good for many body types. The Lucid Gel Memory Foam Mattress is suitable for couples because it absorbs motion well and doesn’t use coils in its design. While innerspring beds can be decent at isolating motion, they usually don’t compare with memory foam options in this department. All Lucid memory foam beds are CertiPUR-US® certified and free from harmful levels of formaldehyde and other hazardous materials. This bed comes with a 30-day sleep trial period and a 25-year warranty. Although the sleep trial period isn’t as long as some other mattresses, the extra long warranty on the Lucid Gel Memory Foam Mattress may be worth it to you. Overall, this is a very affordable bed that offers cool memory foam, spinal alignment, and a long warranty. If you like a softer bed without much bounce and don’t mind a shorter sleep trial period, this could be your best bet. The Layla mattress is a versatile, double-sided mattress, meaning it’s actually two mattresses in one. Side sleepers tend to feel extra pressure on their shoulders and hips and the medium-soft side of this mattress is ideal for that position. Back sleepers should also be most comfortable on this side, while stomach sleepers may prefer the firmer side. You aren’t sure how firm of a mattress you want: Again, the Layla mattress comes with two firmness levels in one: Firm and Medium-Soft. If you aren’t sure what level of firmness you prefer, this is a good way to find out. You don’t want coils in your mattress: This bed is made with memory foam, meaning it contours to your body and provides pressure relief. If you prefer the feeling of being hugged by your mattress instead of sleeping on top of it, you’ll likely appreciate the Layla Mattress. You stand a lot at work: The Layla Mattress provides great pressure relief with its cradling memory foam. If you have a job that requires you to be on your feet all day, this could help ease the aches and pains that come along with that. You tend to get hot at night: If you often wake up sweaty in the night, you will probably approve of the cooling technology used in the Layla mattress. The cover has ThermoGel® for temperature regulation and the first memory foam layer is made with copper, to reduce heat retention. This flippable mattress provides the hugging support of a traditional memory foam bed without the unwanted extra warmth of some other brands. The removable, moisture-wicking cover is a blend of polyester, viscose, and Lycra. If you flip the bed, make sure you also flip the cover. The layer beneath the cover is a comfortable memory foam infused with cooling copper. Next is a 2-inch layer of supportive, egg crate-shaped foam for airflow. Under that is the foundation of the mattress, followed by a 1-inch layer of copper-infused memory foam that serves as the top of the firm side of the mattress. The Layla Mattress has a 4/10 level of firmness on the Medium-Soft side and a 7/10 firmness level on the Firm side. Both sides offer a cradling hug and have almost no bounce. Like other memory foam mattresses, the Layla mattress isolates motion very well. This is a welcome feature if you’re a light sleeper or you sleep with a partner who has a different schedule than you and sleeping on this material should minimize disturbances for both of you. The Layla Mattress is CertiPUR-US® certified, indicating that it’s free from harmful levels of heavy metals and other hazardous chemicals. It comes with a 120-night sleep trial period and a lifetime warranty that will last for the lifetime of your mattress. All in all, the Layla mattress is a great value. With two firmness levels in one bed, cooling technology in a memory foam design, and a lifetime warranty, this could be the best bed for you. And having 120 nights to try it out is a definite plus. Contrary to some of the all-foam designs we reviewed earlier, the Saatva Luxury Firm mattress utilizes springs in its construction. Unlike memory foam, innerspring mattresses give the sensation of lying on top rather than inside of them. Although this bed does come with a soft pillow top, the mattress itself is quick-responding and springy. You could use additional lumbar support: The cover of this mattress is designed to provide extra support in the lumbar region. This is made possible with tighter quilting in that area, which provides relief to that part of your body. And the center third of the bed is cushioned with memory foam, for even more targeted lumbar support. You like to sleep on your back: This bed is popular with back sleepers, as it provides the right spinal alignment for this position. The supportive lumbar region and springs offer good support for lying on your back. You move around in your sleep: If you’re a combination sleeper who moves around a lot, you’ll appreciate the springy feel of this mattress. Instead of getting stuck in the bed, you’ll be able to switch places quickly and easily in the night. 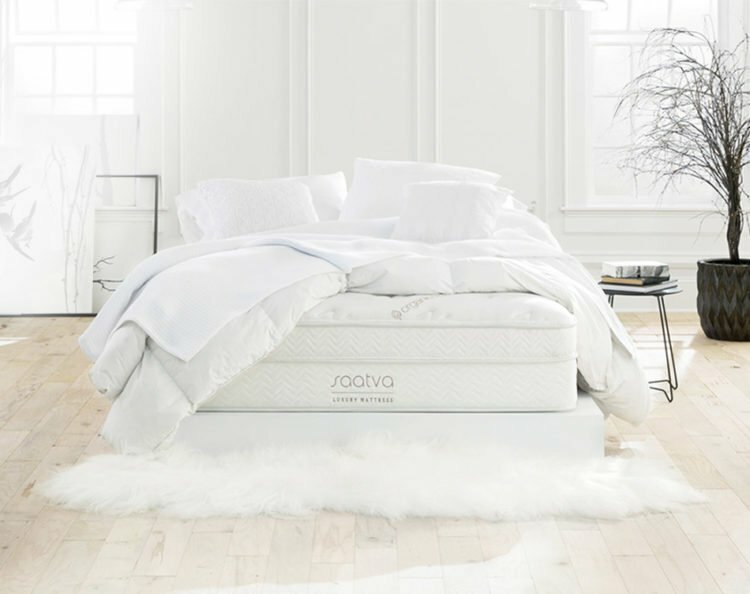 You sleep by yourself: The Saatva Luxury Firm mattress uses coils, so it doesn’t perform as well in the motion transfer category as other beds. Although the coils are individually wrapped to lessen disturbance, this bed is probably most ideal for single sleepers. Since the Saatva Luxury Firm mattress uses an innerspring design, it has more airflow and bounce than an all-foam mattress. It also has foam-encased edges, so the entire surface of your bed is usable and you won’t easily fall off the sides. The cover is made from hypoallergenic fibers and organic cotton with super-durable stitching. It has a 1.25-inch pillow top layer that helps provide pressure relief. Under that, there’s a unique memory foam section in the lumbar area for additional support. Next is a foam transition layer and, below that, 884 coils that are individually wrapped for motion isolation. Under this is another layer of coils to provide more support and prevent the mattress from sagging. This coil-on-coil construction helps with airflow and makes the bed bouncy. This bed should be comfortable for most everyone since it has a medium-firm feel to it. Medium-firm mattresses tend to support all sleeping positions and provide pressure relief. The Saatva Luxury Firm mattress is a 6/10 in terms of firmness, but there is both a softer and a firmer option available. When you press down into the mattress surface, you’ll find that it responds quickly, but that the center lumbar region is a bit slower-responding. This mattress doesn’t do as well with isolating motion as an all-foam mattress, but it does do well compared with other coil beds. If you aren’t a light sleeper, you could probably share this bed with a partner without waking up often. The Saatva Luxury Firm Mattress is CertiPUR-US® certified, which means that it meets guidelines for safety standards. It also utilizes recycled steel innersprings in its construction. This mattress comes with a 15-year warranty and 120-day sleep trial period. If you aren’t satisfied with your purchase, you’ll have the $99 transportation fee deducted from your refund. Given the unique lumbar support area, the airflow, and double layers of coils in the Saatva Luxury Firm Mattress, it’s a good deal for the cost. It isn’t quite as cheap as the other options on our list, but it’s still a bargain for what it provides. The Tuft & Needle mattress is an eco-friendly, bouncy bed that is made without memory foam. Instead of sinking into the bed, you’ll sleep on top of it. This type of surface is great for back sleepers because it keeps the spine aligned. The foam used in this bed offers pressure relief without making you feel stuck. You like a quick-responding mattress: Some prefer a memory foam feel that allows you to sink into the bed, while others would rather have a springy surface. The Tuft & Needle Mattress has a more traditional, bouncy design that responds quickly to touch. You sleep on your back or move around a lot: Since this bed is quick-responding and utilizes foam, it’s suitable for all sleeping positions. But back sleepers will likely find it especially supportive, due to the sturdy base. If this is your default position, or you change positions often, this could be the right option for you. 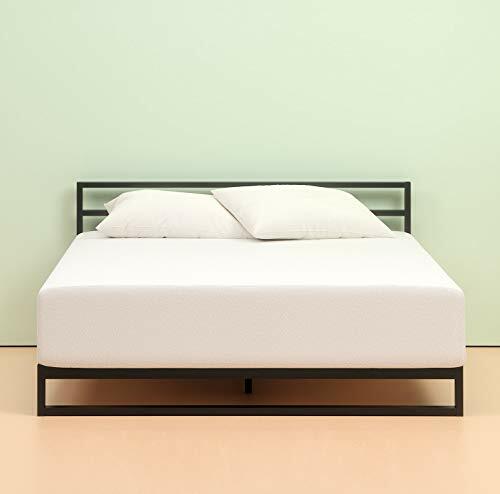 Eco-friendliness is important to you: If you’re concerned about harmful chemicals in the products you buy, the Tuft & Needle Mattress could be a good fit. It passes three different environmental certifications that test for harmful levels of hazardous chemicals. You tend to get hot in your sleep: If you sweat in your sleep, this mattress may provide a solution. 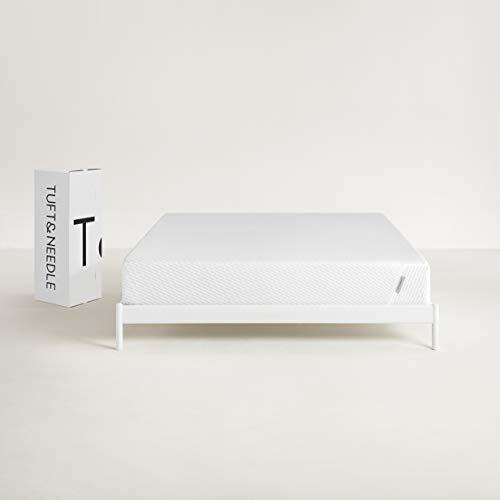 Tuft & Needle uses an Adaptive® foam, made with cooling gel and heat-wicking graphite, so the mattress stays breathable and cool while you sleep. This mattress is 10 inches in height and uses just two simple layers under its quick-drying, breathable, polyester/micro polyamide cover. Under this, there’s a 3-inch layer of polyurethane foam, which has a consistency somewhere between latex and memory foam. Next, there’s a 7-inch layer of support foam to minimize motion disturbance and give the mattress its shape. The Tuft & Needle Mattress is medium-firm, meaning that it’s suitable for the widest variety of people. The cover and top layer of the mattress are soft to the touch and have a springy, quick-responding feel. The foundation layer doesn’t have a bounce to it and is firmer than the top layer. Foam mattresses are usually good at isolating motion disturbances and the Tuft & Needle bed is no exception. If you sleep light or have a partner, this mattress should allow you to sleep soundly through the night without any issues. This mattress excels in the eco-friendliness category and is CertiPUR-US® certified and GreenGuard Gold certified. It’s also OEKO-TEX® approved, meaning it’s been tested for harmful chemicals and found to be safe. This bed comes with a 100-night sleep trial period, after which you can return it for a full refund. If you buy the Tuft & Needle mattress, you’ll also get a 10-year warranty. According to Tuft & Needle, 95 out of 100 customers end up keeping their mattress. Their proprietary Adaptive® Foam provides good pressure relief and you get the bed for a very affordable price. Keep in mind that this mattress reportedly has an off-gassing odor for a while after setting it up. Just keep it in a room with the windows open for a day or two and that should take care of it. You don’t have to sacrifice quality to get an affordable mattress. Whether you prefer certain materials or need a specific function fulfilled in your mattress, one of the options above could be the best low-cost purchase for you.